In Pisaro’s assemblage of strictly timed, crossfaded field recordings, sourced from visits to the California mountains he could credit as co-composer, and an array of percussion sounds created by frequent collaborator Greg Stuart, perception itself is articulated- that is, our perceptions as listener are brought forth as elements of the piece. For example, our ears may very well hear an airy, expansive setting for natural sounds and subtly limned sine tones and carefully placed piano chords. Repeated listens [and a reading of Pisaro’s notes detailing the precise and intricately mapped out graphic score] make clear a number of more nuanced acts of perception are put into play-the gradual erasure of the already illusory distinction between inside and outside sounds; the paradox of how complex and precise the parameters are for the assembled sounds, and yet how organic, unfussy and ventilated the piece sounds; the incremental manner in which the scored elements [Stuart’s layered percussion parts] subsume what is, at the outset of July Mountain, simply recordings of environmental sounds [the field recordings and the score flip within the gestalt of foreground/background]; and, delightfully, the inexplicable [don’t ask me to explain it] play of our perception of duration. I have noticed, reading numerous comments by listeners to this piece, that some report it is the shortest 21 minutes of music they can recall, and others averring time seems to either stand still, or that the pieces unspools endlessly, without beginning or end. Yes. I have been both startled at July Mountain’s brevity and abrupt conclusion, and its immersive and open-ended quality. How does this articulate Stevens’ poem of perception? Even more than the simple pleasure of listening, over and over, to July Mountain, is my growing appreciation for how intuitive a composer Pisaro is, how elegantly he links the easily obfuscated idea of Steven’s final poem [that we are always creating order from the chaos “of patches and of pitches”] to a sound world from his own vantage point. 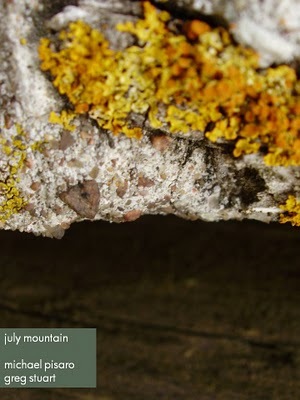 July Mountain is a universe in 21 minutes, and from my vantage point, Pisaro is creating some of the most vital and extraordinary music available to us today. July Mountain is on the Engraved Glass imprint, where Jez Riley French attends to every detail of the music's presentation with great care. In an always incipient cosmos.